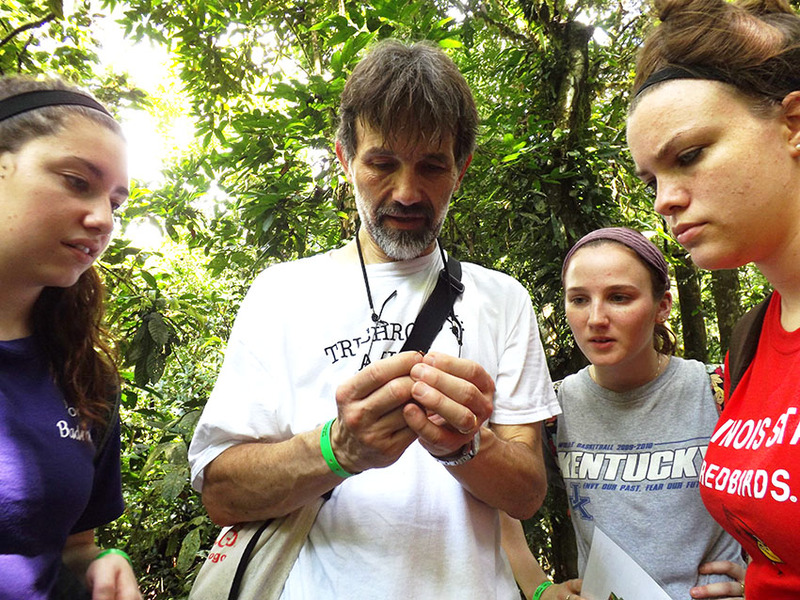 Biology Professor Steven Juliano and biology students Jennifer Achs, Corinne Cramer, Rebecca DeHeer, and Alexandra Rossi spent Sunday morning hiking among the giant trees of the Costa Rican rain forest. 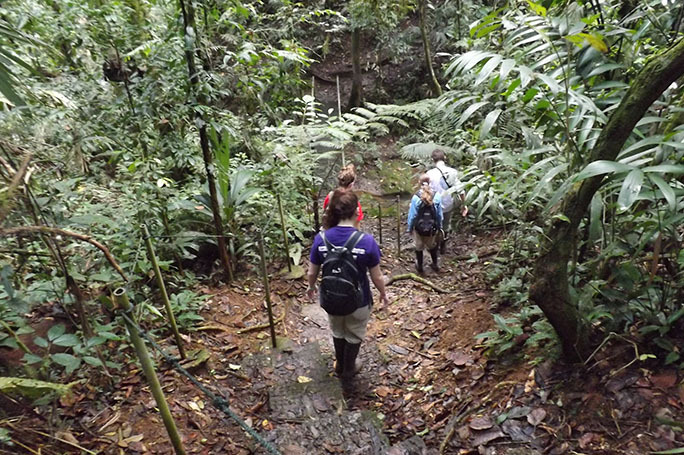 This is the third story in a five-part series on the School of Biological Sciences’ trip to a Costa Rican rain forest. 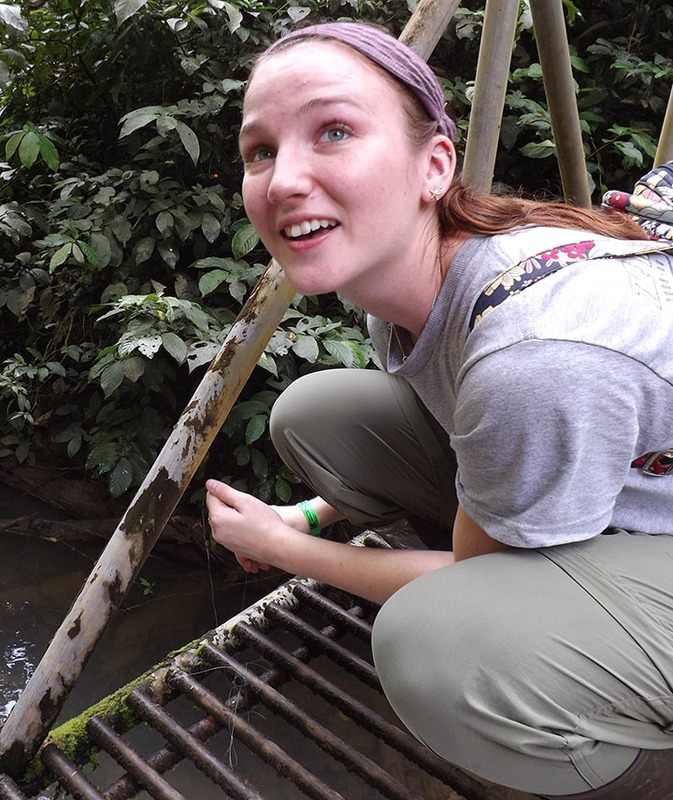 STATEside is along for the adventure as the students and professors of the Rain Forest Ecology class spend 10 days at La Selva Biological Station. A day here is a novel. So I have settled on a play-by-play of this past Sunday morning to provide a brief guide to what life is like on an hour-by-hour basis at La Selva Biological Station. One of the wonders of this place is that the designation of the days—Monday, Tuesday, etc.—means little here. You can pack as many adventures and surprises into a Tuesday as you can a Friday. And no Monday dread was noticeable this Sunday morning. The rumor is that breakfast ends at 7 a.m., so I try to sleep until at least 6 a.m. But someone forgot to tell the animals. Our first morning here a crew of howler monkeys, the rain forest’s (much cooler) answer to that annoying dog that keeps the neighborhood up all night, began its a cappella concert at 4:30 a.m. A sweeter sound awoke me this morning: Tropical birds sang their morning chant just as the sun rose. This is life in the rain forest. At least I was enjoying it from the comfort of my fan-cooled, mosquito-proof cabin. The comforts of La Selva extend to the clean, tiled bathrooms. 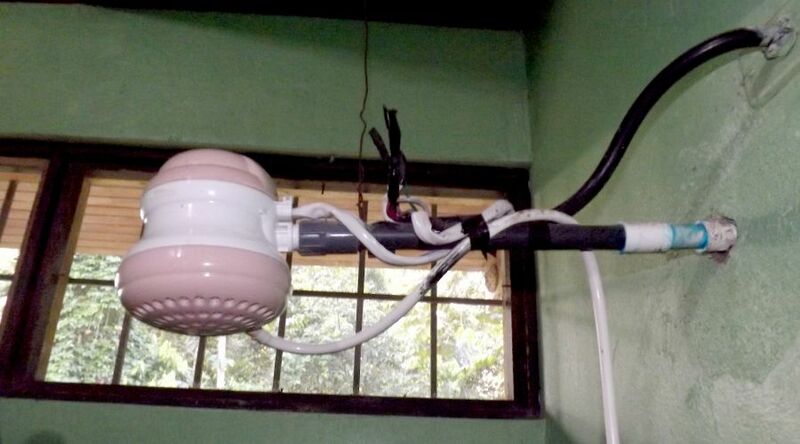 The highlight is the strong-flow showerheads, which have an alarming tangle of wires but work better than the one in my Bloomington apartment. After eating three meals a day here for the last three days, I can probably guess why it is difficult to find a Costa Rican restaurant anywhere outside the country. The food is hearty and features an abundance of tropical fruits: papaya, pineapple, plantains. It is good fuel when you are spending your days trekking through the forest. That said, all three meals are centered on rice. Chicken with plain white rice, beef with white rice, fish with white rice. The one variation is breakfast. That’s when gallo pinto makes its entrance. This black bean and rice dish goes well with an egg. 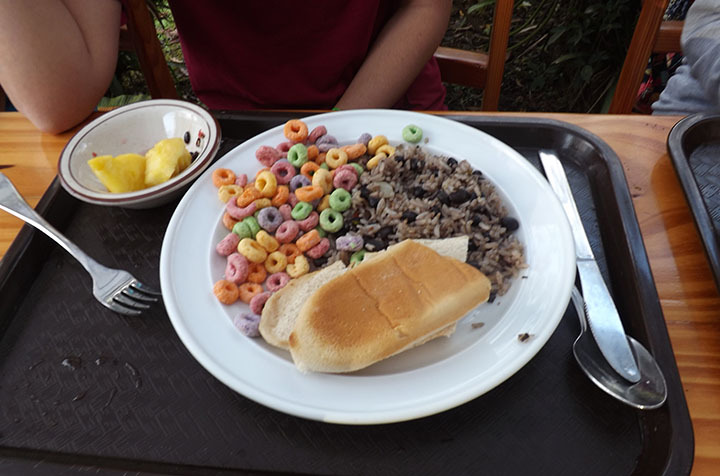 Graduate student Meghan Strange added her own twist: a side of Fruit Loops. “How did the Atta people make out?” This was not a reference to science fiction. No, this was Biology Professor Joseph Armstrong asking some students studying leafcutter ants, aka Atta, how their research projects were coming along. This trip is true academic immersion: Biology is the main topic of conversation 24/7. 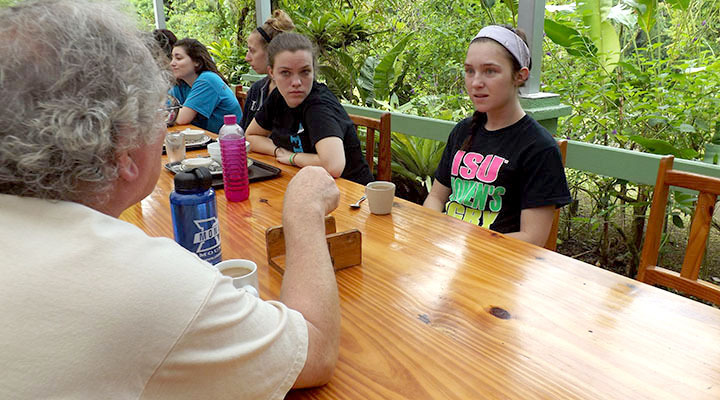 Biology Professor Joseph Armstrong gets the biology conversation started early with students Rebecca DeHeer (left) and Katilyn Gerstner. 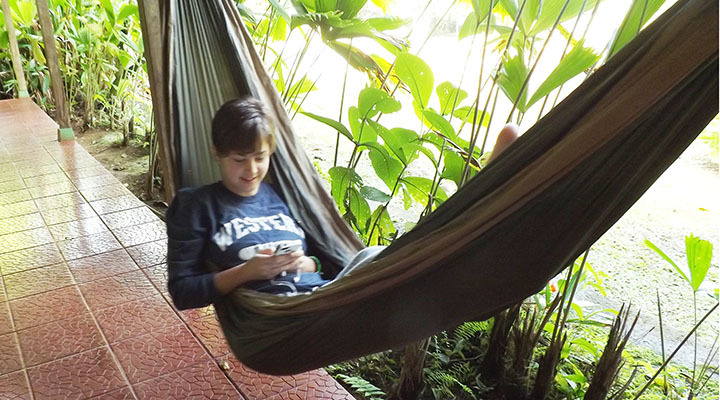 Students retired to their rooms and to a conveniently placed patio that has three hammocks in order to check out the Internet (the Wi-Fi signal is surprisingly strong) and catch a breather before a day of hiking and research. It was 70 degrees, sunny, and much less humid than the swimming-in-your-clothes afternoons. The winter weather in Normal did not go unnoted here. Graduate teaching assistant Molly Schumacher enjoys the comforts of a hammock before a long day in the forest. The animals of the rain forest are elusive. Visibility during the day may stretch 20 feet, at night maybe 20 inches. You can walk for miles and not see any of the larger mammals. This is particularly true of the area’s wild cats, which include ocelots, jaguars, mountain lions, and jaguarundis. Juliano said they have been spotted by motion cameras on La Selva’s campus but seeing them in person is a different story. “They’re there. They just don’t want to be seen,” he said. We spotted a tinamou wandering around not far from the path. This ancient, chicken-size, brown bird is related to the ostrich, Juliano pointed out. 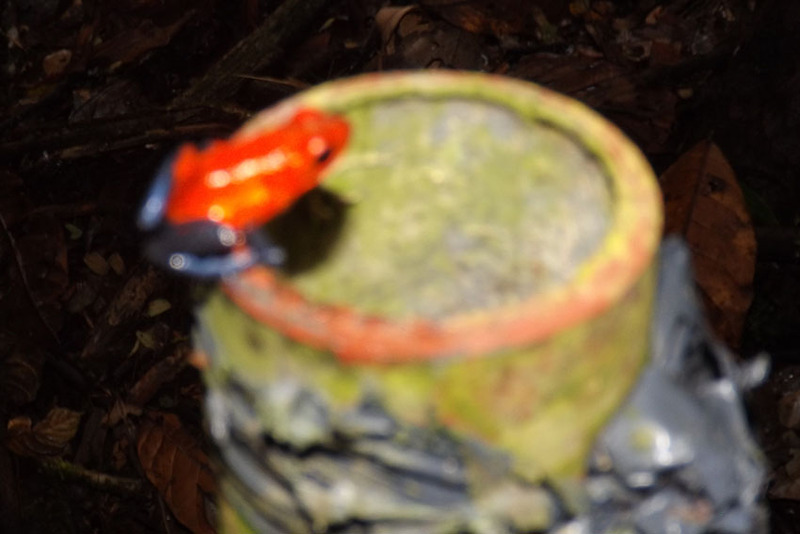 We found a red poison-dart frog sitting on a post next to the trail. This group of frogs earned its name from how some Amazon Indians would use the toxins from the skin of members of this group to coat their darts. Despite our gawking, the frog remained motionless. Because this frog normally drops its eggs in pools formed by bromeliad leaves, Juliano guessed it may be a female guarding its tadpole in a pool at the bottom of the open-top post. As we inspected further, he noted that this was likely not the case. Nevertheless, one of the great parts about these hikes is the exchange of ideas that takes place among the students and professors. Achs, our guide for the morning, accidentally took us down the wrong path. It turned out to be a nice diversion as we saw a monkey climbing through the canopy in the distance. Getting truly lost here is hard if you stay on the trails. La Selva has an extensive system of concrete paths, smooth enough for bicycles, that extends for miles into the rain forest and leads to rougher trails that can take a week or more to follow to their end. We checked out the research project that Achs is conducting in a stream named Sura. She is studying diatoms, a type of algae that helps indicate the health of a stream. The higher the number of and diversity of diatoms in the stream, the healthier the stream is likely to be. Jennifer Achs checks on her study of diatoms in the Sura stream. I learned this the hard way when I became the lead hiker momentarily and took an unidentified spider’s web to the face. Luckily for me, in a place crawling with all manner of large spiders—wolf spiders, golden silk orb-weavers, tarantulas, jumping spiders—the owner was not home. 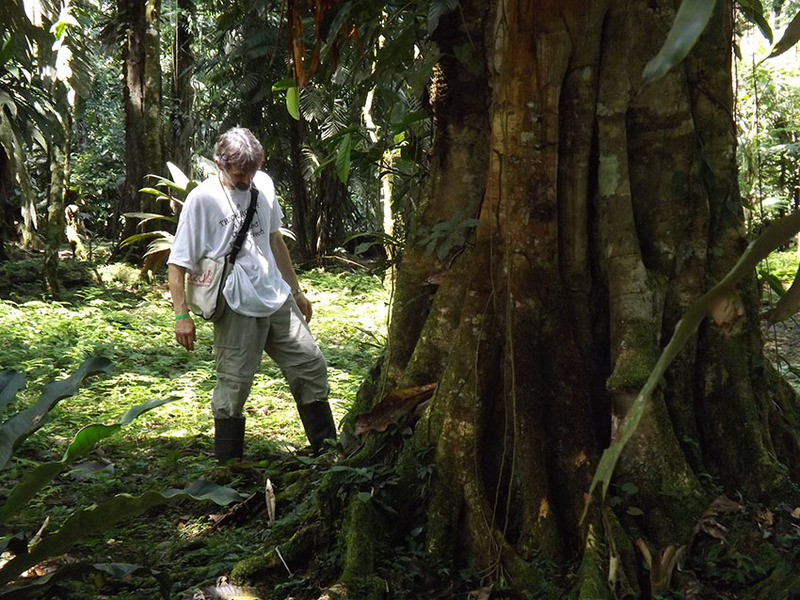 In one section of the rain forest, not far from campus, La Selva has cleared out much of the undergrowth to allow for the study of several types of trees and the organisms that live on and off them. The park-like setting was a welcome respite from the sometimes suffocating density of the jungle. As we entered, we spied a scampering whiptail lizard, and as we left, we encountered advancing and retreating lines of army ants. Biology Professor Steven Juliano inspects the arboretum. Just off the trail we saw what looked like motorcycle tire skid marks to me. Cramer and Rossi noted that in fact the trails were cut by marching lines of leafcutter ants. “It’s like a highway,” Rossi said. They explained that millions of female ants, working at the queen’s behest, spend their days carving these trails as they retrieve and bring back leaf pieces to the colony to fuel the fungus that they eat. And the males? “Mate and die,” Juliano said. The group gets a closer look at an army ant. “It was a nice morning,” Juliano said as we went our separate ways. The timing of our return was fortuitous as I saw a flash of bright color pass overhead. 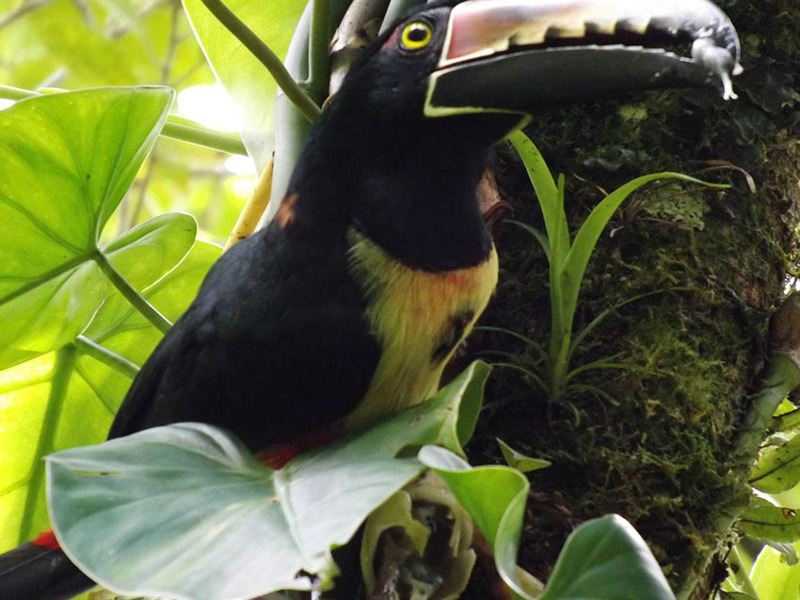 It was a flock of toucans that stopped to eat in some trees near our cabins. They reminded me of something: Man, was I hungry for some rice. Just as I was finishing up this story, a bat flew into my cabin. Getting it out without it biting me or me harming it is a story for another time.